With a population of around 740,000, Mississauga is Canada’s 5th largest city, and the third most populous city on the Great Lakes, behind Toronto and Chicago. That means that Mississauga as a city has a great population than other “larger” American cities like Detroit, Cleveland and Milwaukee. Even better, Mississauga’s population continues to grow; having almost doubled over the past two decades. Mississauga was initially developed to be a suburb of Toronto. But that once small peaceful suburb has developed into a booming metropolis in and of itself. Mississauga is home to many corporate and industrial offices such has Hewlett Packard; GE; Pepsico; Siemens; Walmart Canada, Goldfinger Law and Microsoft, which help differentiate the city from other suburban style communities. In addition, Canada’s busiest airport, the Pearson International Airport is located in Mississauga. Square One Mall is the largest mall in Mississauga, and is also the second largest mall in the GTA. From a transportation and thus a personal injury perspective, Mississauga is a very progressive city. It’s one of the first major Canadian cities to adopt, implement and invest in a comprehensive bicycle path strategy. The Cycling Master Plan was adopted by the City of Mississauga in 2010. Goldfinger Law is a proud supporter of the Cycling Master Plan for Mississauga. The Cycling Master Plan will build over 900km of cycling path both on and off road over the next 20 years. This cycling system will aim at reducing congestion on the streets of Mississauga to reduce commute times, reduce volume, and make the streets safer for cyclists. This will hopefully reduce the amount of car/bicycle accidents in Mississauga. Only time will tell if this plan will be effective, but it’s certainly a step in the right direction to help cars and bikes share the roadway. If all goes well, there will be fewer and fewer cycling/car accidents in Mississauga. Car accidents involving bicycles are often the most serious personal injury cases. 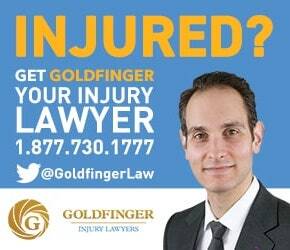 Goldfinger Law handles these cases. They may result in traumatic brain injury or other orthopaedic injuries. When somebody is hurt in an accident in Mississauga, they may be taken to Trillium Health Centre, Credit Valley Hospital or the William Osler Health Centre. The Court which hears personal injury cases which occur in Mississauga is in fact not located in Mississauga. Rather, it’s located in Brampton. The Brampton Ontario Superior Court of Justice located at 7755 Hurontario Street hears all cases commenced in Mississauga or the Region of Peel.